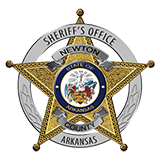 The Newton County Sheriff's Office completed a jail standards class on Friday, August 8, 2014. Front row from left to right: Hayley Morlen, Kim Robinson, Zanetta Carlton, Jim Henry Blue Reece. Back row from left to right: Sheriff Keith Slape, Jail Administrator John Griffith, Cody Hudson, Steve Williams, Jared Curtis, Trevor Shearer, Jeremy Sisco, Investigator/Instructor Ryan Watson, Chief Deputy/Instructor Jarred Morgan.